Extra, Extra! Read all about it! For today's reading pleasure, check out the August 4, 1978, edition of the North Star Siren! This issue features stories on the play, Pow Wow Day, the social, Tri-Camp and more. We hit the road at the start of each year as both camper and staff fairs pop up across the country. If you know of a prospective camper looking for something to do this summer or a friend looking for a job, encourage them to stop by for a visit. We're also available for appointments. For more information, contact us at office@northstarcamp.com. We'll also be scheduling more trips throughout the spring! It has been quite a year at North Star, and it has been quite a year for the North Star family. 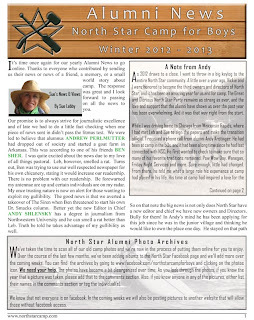 The latest version of the North Star Alumni Newsletter has all the details from the latest happenings at camp to updates on the whereabouts of alumni dating all the way back to the first years at North Star. Sue has worked very hard to compile a comprehensive roundup of news from North Star alumni across the country and the world. We always love to hear from you and hope that you will keep us up to date on your latest news. Just head to the Alumni website (www.northstarcamp.com/alumni) and visit the Send Alumni News page. And we hope that you stay abreast of all the happenings at North Star too. Stay up to date by following us on Facebook, Twitter, and LinkedIn. And help spread the word as well. If you know of anybody that may be interested in North Star for their son, please Refer a Friend. Save the Date - North Star's 70th Reunion! The Summer of 2014 will mark North Star's 70th summer. To celebrate this occasion, we are in the process of putting together an incredible alumni reunion weekend. Please mark your calendars for August 15 - 17th, 2014. Keep an eye on your inbox for more information. We hope to see you at the Council Ring then!